Former Ghana international Nii Lamptey Odartey has signed for South African premier league club Jomo Cosmos. It will be the 11th country that the one-time teenage prodigy has played in, including spells at Aston Villa and Coventry City in England. The 32-year-old played at the age of 16 for Belgian club Anderlecht and won an Olympic medal with Ghana at the 1992 Barcelona Games. 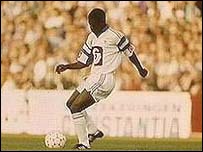 He has also played for clubs in Italy, Argentina, Turkey, Portugal, Germany, China, Saudi Arabia and his native Ghana.